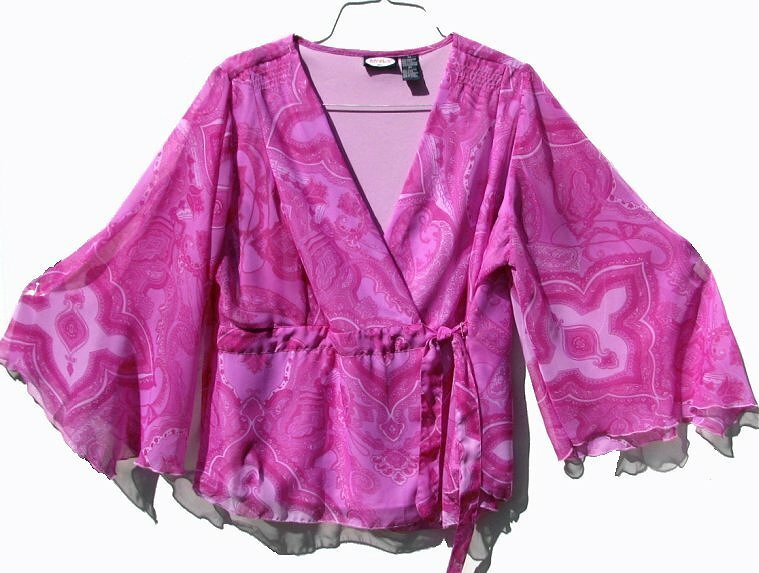 This blouse possesses a wonderful burst of color perfect for a 70s party. The overall color of this looks different depending on which room I have it in or if outside. The coloring is not this loud. In some lighting (outside for instance) it is shades of fuchsia. In this room the color is much more muted more of a purplish mauve. The lining is a stretchy polyester microfibre. The overlay is polyester chiffon. The fit is a 3x. The shoulders would fit a 2x, but the chest is quite wide or large as it is 46" - 48". The waist can fit a 36" to a 44" waist, maybe larger. The blouse would be a size 20. It is new without tags. Email if you need a 1x or 2x. I have more of these somewhere here. Waist: ca 38" - 44"